We were cycling through a not-at-all-beautiful area of London called Limehouse yesterday, when glimpsed amidst the traffic, discount stores and council estates, I spotted this handsome old house standing secluded behind some railings. A notice outside said that it was the head office of the Royal Foundation of St. Katharine, an organisation I'd never heard of. I spotted a little notice, though, with an arrow directing passers-by to the Yurt Cafe, and that sounded interesting. So I followed a long wall, turned a corner and came to what looked, at first, like an industrial site. 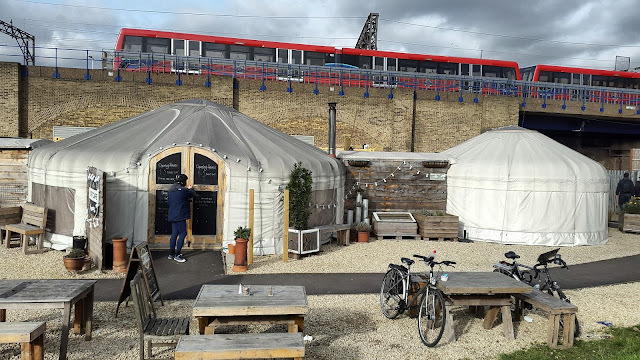 The trains of the Docklands Light Railway rumbled constantly over the nearby viaduct, but there was certainly a yurt there, as well as tables where you could eat outside. And there was a Quiet Space just down the corridor, warm, relaxing and welcoming. Most of the activity on the site was carried on in brightly painted metal containers. I stepped inside the Precinct office where I found photos of the sort of things that happen there, from printmaking to meditating to community gardening. I thought St Katharine's Precinct was such a nice place to hang around that I was a bit sorry it wasn't nearer home. Out of curiosity, I looked up the Foundation of St Katharine, and discovered it was founded by Queen Matilda in 1147 AD. It has offered spirituality, hospitality and service since that time. It even runs a b&b where you can stay. I'm sure Limehouse has changed a lot since 1147, and probably not for the better, but I like the idea of going on a slightly monastic mini retreat in the grounds of that old house, in an oasis of spirituality and history in the midst of the heavy traffic, trains and noise. Now, here is a slightly time-travel trip that you can take yourself in London. Go to this spot on Google Street View - it's Cleveland St., London. (Or at least, I hope it is - never quite sure with Street View). See the house with the round blue plaque on it? 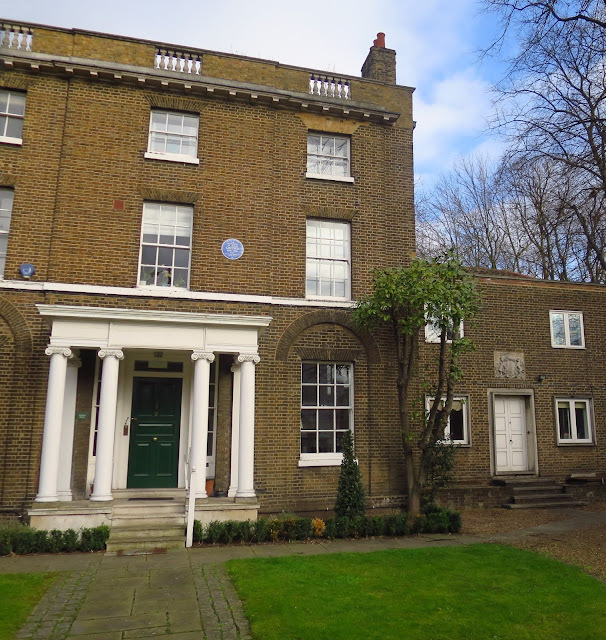 Charles Dickens lived there during his not-very-happy early life. Here's a photo of him looking young, earnest and just a bit teenagery. Go back to his house on Street View, turn left along Cleveland St past Dennis Publishing and Middlesex House, continue a few more steps and you'll come to a boarded up old building, once known as Cleveland St. Workhouse. Charles Dickens would have walked past it almost every day, and it is thought to be his inspiration for the workhouse in Oliver Twist. Here it is on Street View, in case you missed it. Cleveland St. Workhouse was built by 1778 to care for the sick and the poor. In its early days, it was humane, but by Dickens' time, workhouses has become cruel and harsh places, and Oliver Twist reflects that period in its life. Later, times changed again, and this building was returned to its original use of caring for the sick, becoming part of the large Middlesex Hospital. The main hospital was pulled down a few years ago and replaced by "luxury" flats. Costing over £2m each for 2 bedrooms, you can take a look here, and you might agree that there is not much luxurious (or attractive or interesting) about them, really. London has many blocks like this which are aimed at property speculators. They usually don't live there but buy them in hopes of turning a profit later. Developments of this type create areas of deadness in the bustling city streets. There is now a plan to gut the 18th century workhouse to create more of this kind of "luxury" and, in the graveyard beyond it, which is full of paupers' bones, another huge block is proposed, with, shockingly, no care about what happens to the remains of the dead human beings who lie there. There's more about the workhouse and Dickens here on David Perdue's blog. You can also find the planning application for the graveyard flats here, where the links at the bottom take you to where you can comment to the planning board. If you do want to comment, deadline is really soon - 23 February, in fact. Oh - and I've just heard fromphotographer Mo Smith, of the fascinating "Fresh Eyes on London" blog, that she has posted about this too. A bit depressing, that, but never mind, Spring is on its way, even in the busiest parts of London. 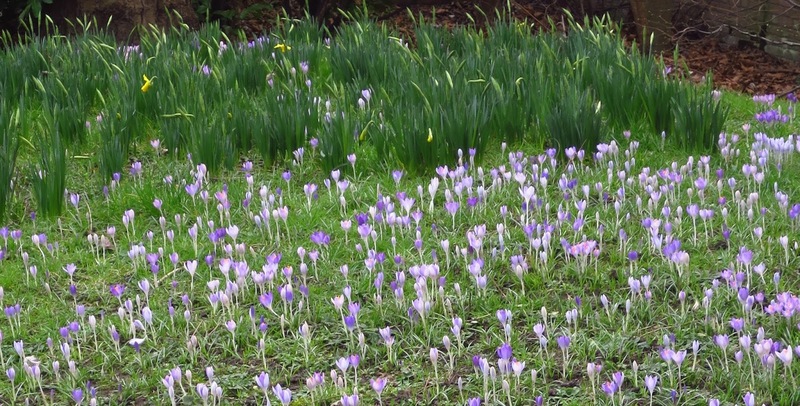 I was really delighted to see these brilliant crocuses in the nice park in Limehouse. And it was wonderful to see so many flowers all together after the months of winter. You do take the most interesting walks/bike rides. Hope they stop the destruction of the workhouse. Pulling down the historic old places to build generic new places just doesn't seem right to me. If i ever get to London again, i want to visit that yurt. That yurt is brilliant. Love those flowers you take gorgeous photos. They really aren't interesting. I once did not like Pete Seeger's song, "They're all look just alike," and my reasoning was people needed housing. But I do have sympathy for condemning their ugliness at that speculative price. My goodness! 1147 A.D. - and it only seems like yesterday!! That's a long, long time ago! Wow! The yurt makes me feel claustrophobic, I imagine, in reality it's not. I learn so much from your posts. Thanks for sharing your incredible knowledge. Hello Jenny, what an interesting post. First, that yurt is wonderful and who would have thought to find it in the midst of London! And to think the St Katherine's foundation has been around since the 1100's and still going strong evidently. Thank you, Queen Matilda. Second, so sad to hear about the endangered graveyard and building that may be destroyed for the sake of property developers and investments. I didn't follow the google street view links (yet) but I will after this comment. And third, the flowers match your blog colors and it's good to see signs of Spring. I hope you have a lovely week. Can they really just build over remains that way??? Those blocks are so ugly, are they meant for singles or families??? I'm glad to know the area has some redeeming qualities and the flowers are beautiful. You aways find interesting places and their stories. Thanks. What an interesting post! You certainly go through life with your eyes and ears (and mind) wide open, and manage to find pockets of goodness and beauty even in the middle of all the noise and dirt of the big city. 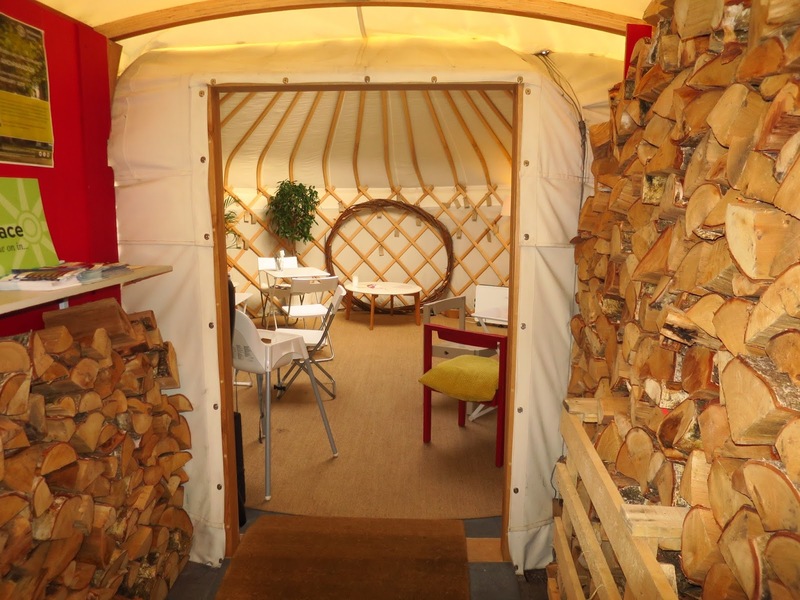 Yurts have become all the rage over the last 10 years or so, haven't they! Charles Dickes does indeed look teenagery in that photo. The crocus pictures are great - I have not seen that many yet, but I am sure it is only a question of time before the gardens here will become dotted with bright flowers as well. The yurts do look interesting Jenny, and like a Tardis seem to look much bigger from the inside. I imagine they would work well on even the coldest days, a nice warm spot to escape to. The Foundation of St Katharine is incredible; who would have thought any organisation could last that long. Perhaps the secret lies in being quiet about it. Always fun to see the haunts of Dickens - it seems everything in the books can be traced back to somewhere. We loved going to Rochester and finding various aspects of the books. Happy crocus for Spring! Thank goodness Charles Dickens' work remains. All this knocking down and rebuilding without thought of the past seems to be a popular pastime for many counties in the UK. So sad but I guess life (or death) moves on. Very interesting post, Jenny.I had never heard the word yurt before so that's my lesson for the day. 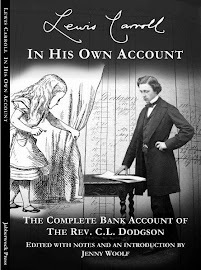 Interesting info about Charles Dickens, the workhouse and subsequent developments. Most streets in London have fascinating histories. I was wandering round Southwark just after Christmas, the area near the Tate Modern, marvelling at the eclectic mix of old and new. I must say I'm not at all sentimental about graveyards. I intend to be cremated, but even if I was buried, it wouldn't matter to me if my remains were eventually dug up and disposed of to make way for some building or other. I have lived in England during a cold winter and I will never forget the joy of seeing the first crocus! So some things do last...even if they change their shape somewhat over the years. Lovely post....though I have never understood the yearning for yurts. 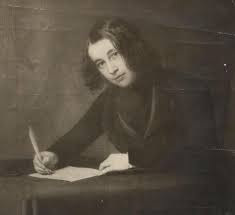 Charles Dickens looks a wee bit like a very disheveled Emily Dickinson in that portrait! I think I found the workhouse. That's fascinating history and yes, a little sad, considering the graveyards. Is that the Post Office Tower in the back (or at least it was called that in 1973 when it was fairly new and my mum and I went to London.) We had lunch at the top and it slowly revolved and it was a very big deal for me back then! The St. Katharine's place sounds like a fun find and I could see you doing a weekend retreat there and coming home with something quite lovely! Whenever I think of Limehouse I think of Limehouse Blues and opium dens. A different time. (Or maybe not!) Thanks, Jenny -- this is a fun post! You know so many unexpected corners in London. These are fab! The house is charming. Its a shame and a horrible wrong they are tearing down landmarks for housing. It makes no sense given the rich history of your country. We are going to find there is no charm left in London soon. We do not need more expensive apartments. I took the tour via your links and that was fun. Google Earth is an amazing thing. The crocus are so beautiful. I must go out tomorrow and check my gardens to see if any of mine are up. The wonderful oasis in the midst of the buildings is exactly the sort of place that I would love to spend time simply because it looks so calm in the midst of the claustrophobic city. The more I see of London the more I think that, despite being beguiled by the idea of seeing old haunts and visiting the galleries and museums again, I am unlikely to visit again. However I do have your blog posts to give me hope. 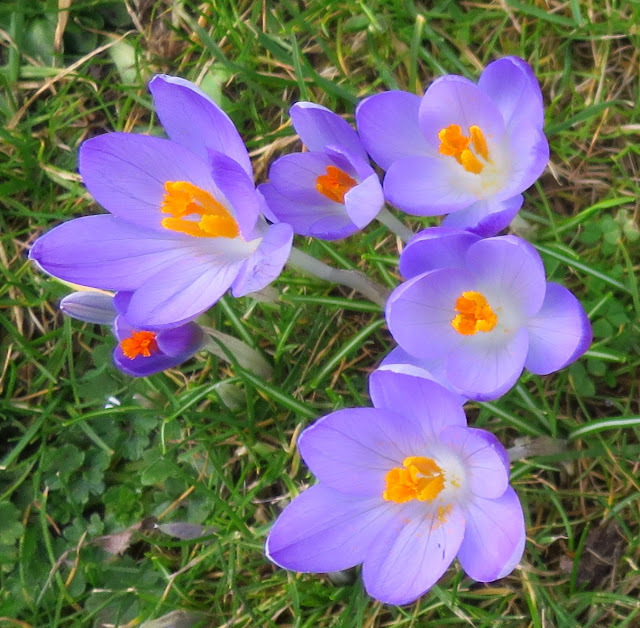 I love the crocuses: mine are all wind-blown and straggly looking unfortunately. 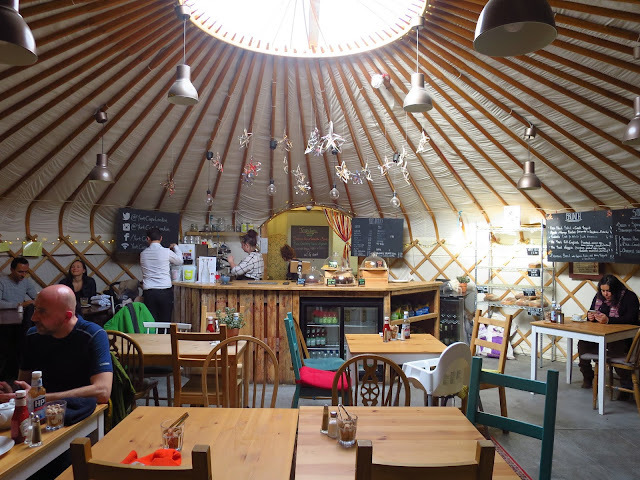 What a brilliant idea - a yurt coffee house! St Katherine's looked interesting. A nice retreat in Limehouse. Another good tour with loads of interesting info. Real gems; both the yurt cafe and the crocuses. It is wonderful, to stumble upon a hidden corner of London with all its history. I shall look out for St Katherine's next time I am in Limehouse. I also enjoyed the trip around Cleveland Street, especially because, a long time ago - over 40 years now, a younger me worked there at the now demolished Middlesex Hospital Medical School so that area was my stamping ground. Very much changed now and like so much of London, it is built willy-nilly on the bones of our ancestors. Fascinating. Thank you. Thank you for another very interesting post. I experienced a yurt in Kazakhstan. They are wonderful structures, and because of their portable natures they can be used on virtually any piece of land. Fascinating account, as usual. I do not see how you-all could get anything new built around London (anywhere in the British Isles, for that matter) because every shovelful of dirt could unearth some historic treasure that demanded preservation of the site. A fascinating tour, Jenny. Love the Yurt (good old St Katherine!) place - it's wonderful, the things people do - and the crocuses are sweet. 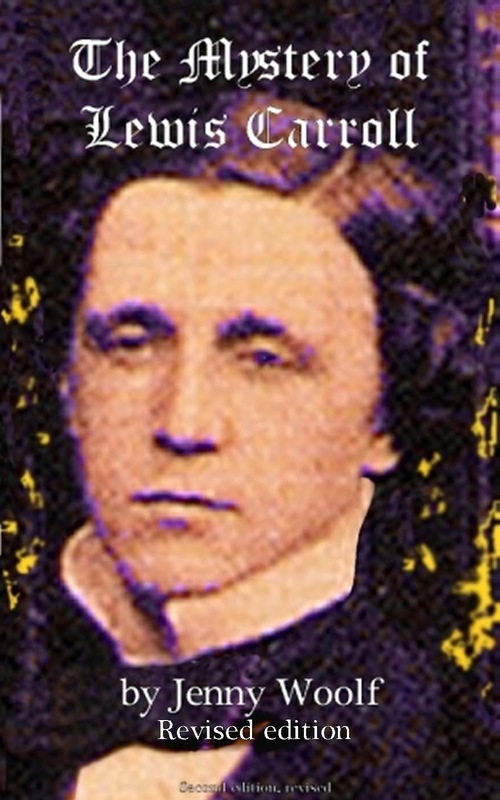 I've never seen a shot of the young Dickens - assumed he'd always had that faintly shaggy, lived-in, appearance... Unwelcome development - hmm - BIG subject. I agree with much that people have said, and love heritage (as you know! ), but also recognise that we need to throw away old clothes and buy new ones sometimes. How wonderful to hear that you were cycling through your town.The grand house is really England with its rich history. Love to see that spring is arriving to your place and new flowers have come out.Happy day to you! Inside of the portable Mongorian tent house looks very comfortable. I was wondering what kind of silence you had inside. I have to say we rather like Limehouse, Jenny, but I suppose that's because there are nice bits of river, and a basin and a canal there. That house is beautiful, you're right. I find these posts and the information you give us on the background so interesting. I'd never heard of the Foundation of St Katherine before! 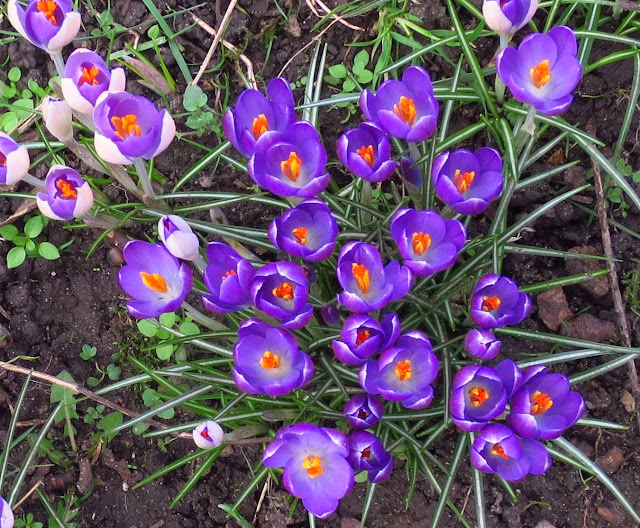 And the crocuses are gorgeous! Love that yurt cafe it looks so cosy and inviting - there are a couple near here and they sell organic produce, homemade ice cream etc in one and serve refreshments in the other. Just going to investigate the google link you gave. Any cafe with HP sauce on the tables is depressing to me! Yes Spring is on the way, I think, although today I'm just praying the roof doesn't come off our house. Is there any part of London you haven't seen yet! Thank you for letting me know that my blog has lost all photos. I did not notice that until you wrote me. I mistakenly deleted my Picasa album. It is sad. Thank you again. Have a good new week. What a great hidden corner of London to find and the crocuses are stunning. Jenny, thanks for sharing! I've never been to this area of London and am interested in it. Love reading Dickens's novels from my childhood, I liked the last film by his book 'Oliver Twist'. It's wonderful that such old buildings were stored till our times. That Yurt Cafe looks like fun. Seeing crocuses always makes me happy - such a hopeful sign! How interesting that the area you found not beautiful filled your eyes with such exquisite sights!!! 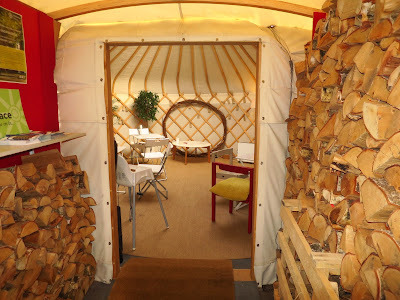 loved this virtual visit to yurt cafe dear! I enjoyed reading your post. Glad their are some havens in the concrete jungle! Thank you. Love love, Andrew. Bye. I must get over there for another explore. I haven't come across the Yurt cafe before. Thank you to everyone who has commented on this post.Each and every one was read and really appreciated. I like to reply individually but it hasn't been possible to do it - I'll try to do better in future.